What it is: A delicate, cleansing shampoo that features the tropical essence of coconut. What it does: Our Coconut Shampoo is an extra-mild hydrating formula that gently washes away any build-up to leave your hair clean, fresh and healthy. 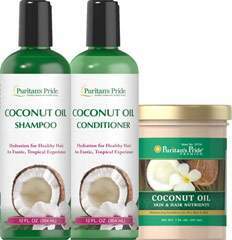 Additional information: This lightly scented shampoo is made with 100% vegetarian ingredients, and pairs perfectly with Coconut Conditioner. Never tested on animals.